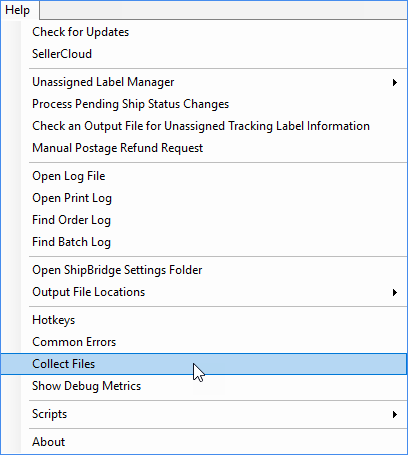 To troubleshoot order issues in ShipBridge, SellerCloud Support may need the files, logs, and settings related to the order(s). You can easily collect them into a zip file. Do you only need to export the Settings file? See how. In ShipBridge, go to Help > Collect Files. Show me where. 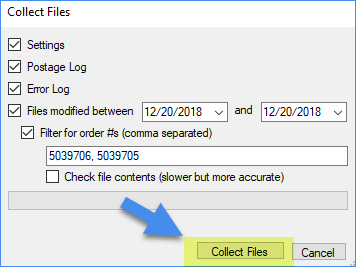 In the Collect Files pop-up, all settings and log files are checked by default. Save the zipped files to a designated location. Attach the zip file to your support ticket or to an email to your SellerCloud account manager.